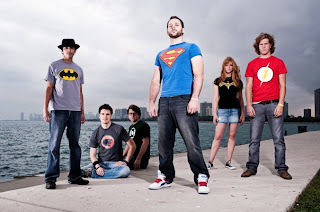 Soon after NES/superhero-themed pop-rock troupe I Fight Dragons came onto the scene last year with frequent live shows and an introductory EP, Cool Is Just a Number, it became very apparent the Chicagoans were focused on getting as many people hearing their music as possible. They've been masters of social media and self-marketing to the point where they quickly became one of the city's most well-known indie acts, and all along the way their enthusiasm and commitment to the success of the project has been crystal clear. That's why the band's announcement earlier this week that they've been signed to a major label, Photo Finish / Atlantic Records, shouldn't come as too big of a shock. In the announcement, the band revealed that they would be releasing their debut full-length record on the label, for distribution in retail stores nationwide. Plus, they'll head out on tour this Spring with fellow Atlantic acts 3OH!3, Cobra Starship and Travis McCoy. As pointed out in a post on the announcement by Chicagoist's Tankboy, signing to a major often winds up becoming more of a curse than a blessing. But in the right circumstances it could lead to a great deal of opportunities that would otherwise be unreachable, and I Fight Dragons noted that they will be holding onto "huge amounts of creative control," so we'll assume only the best. After all, there are undeniable limitations that come along with a total DIY approach, and nobody should fault a band for wanting some help with getting music into people's ears (and hopefully getting some monetary reward for their art). We wish the best of luck and congratulations to the band, and look forward to hearing the LP! For more information on the signing and upcoming tour dates, visit ifightdragons.com.